Salmon migrating up a stream. Credit: Peter Sircom Bromley. Fisheries and habitat scientists often focus on how vegetation and physical structures can create or enhance habitat for fish. 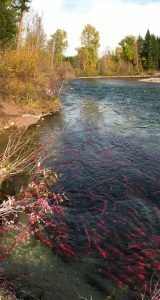 But a recent article turned the tables by evaluating how salmon carcasses provide nutrients that enrich soils and lead to increased tree growth along the banks of a stream. Dr. Thomas Quinn and colleagues at the University of Washington have been visiting the same stretch of Hansen Creek in southwestern Alaska every summer for the past 20 years to record information about the salmon spawning season. Pacific salmon have an anadromous life cycle, growing up in freshwater, living their adult life in the ocean, and returning to rivers and streams to spawn. When the adults make their return, Dr. Quinn and his colleagues were there waiting to count the number of fish that arrived upstream. The original research goal had nothing to do with tree growth; instead Dr. Quinn’s team was focused on recording the number of live salmon that migrated up into Hansen Creek and quantifying the amount of predation that was occurring by brown bears. To achieve this, researchers would walk the creek daily and, to prevent recounting, throw any dead fish to the shore on river left. At the time, the decision to always toss fish onto the same side of the shore was simply for consistency. But, after 20 years of repeating this process each spawning season, they realized that they were creating a unique opportunity to evaluate the influence of marine-derived nutrients to the vegetation that grows along these creeks. 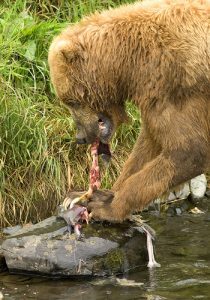 Brown bear consuming salmon. Credit: Public domain. In 2016, Dr. Quinn and his colleagues sampled tree growth and nutrient enrichment between the two banks of Hansen Creek. Their work focused on living white spruce (Picea glauca), the dominant riparian tree species in the area. They collected increment core samples to determine growth rates through time, and sampled needles to determine nitrogen content and stable isotope ratios. Isotopic analysis is used to understand how various nutrients move through food webs because the ratio of light to heavy nitrogen isotopes are retained differently in primary producers (such as spruce trees) than in predator species (such as salmon). Interestingly, before the experiment started it was the opposite shoreline from where the fish were deposited which had greater tree growth. This difference could be due to natural conditions such orientation to the sun or the rate of decomposition for organic matter. 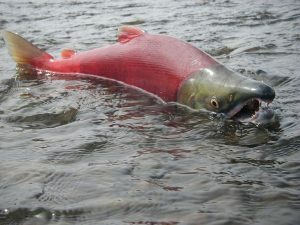 However, the analysis showed after the 20-year period of depositing salmon, the shoreline that received the fish had enhanced growth and had significantly different stable isotope values than the natural shoreline. The analysis of the stable isotopes indicated that the nitrogen incorporated into the new tree growth had a marine origin, as you would find in decaying salmon. Migrating salmon. Credit: Public domain. While this research demonstrates an interesting effect of fish positively influencing vegetation growth, in the long run it will produce improvements for fish habitat as well. If the decaying salmon provide nutrients that allow riparian trees to grow larger, these trees might eventually fall into the stream as woody debris and thus improve the in-stream habitat. Additionally, larger trees may produce higher density of leaves that provide shading to keep water temperature cool in the streams and contribute more leaf litter that is food for macroinvertebrates, bolstering the stream food web. Previous story Could Michigan welcome a once-native fish back to its waters?